Her birth was like a festival. We couldn't wait to welcome our daughter. Prabhavati and I were just lost in our dream until Sharika was 45 days old. She had diarrhea, and I recognized it as a symptom of food allergy/food poisoning. What I didn't expect is for her to be battling to survive for 5 months. Once I realized that my child had stomach issues, I rushed her to the local pediatrician. He said there was nothing to worry. It was quite common in new borns. Sharika began to have diarrhea almost every hour whether she had eaten or not. It was frighteningly persistent. She was extremely dehydrated, which is when we had her admitted to the hospital. At first, she was on observation. Sharika would either vomit or pass by diarrhea anything she consumed orally. She was always dehydrated and also losing out on nutrition. They tried providing nutrition intravenously to help her body recover while they proceeded with a diagnosis. Sharika has been diagnosed with an infection. 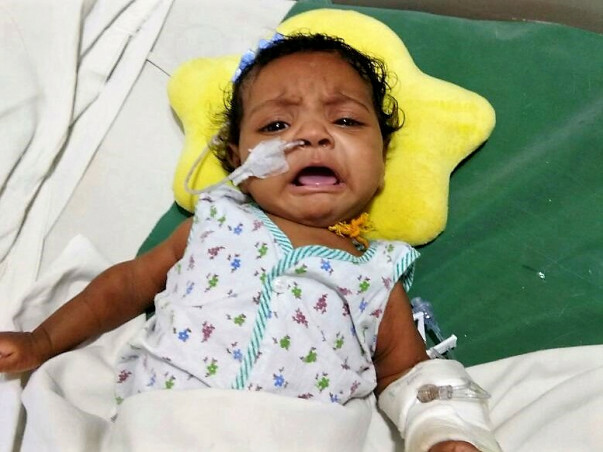 Her intestines have been affected with CMV (cytomegalo virus) causing colitis. She needs long term intravenous nutrition until the virus is completely out of her system. For 3 months she has not had an oral feed. 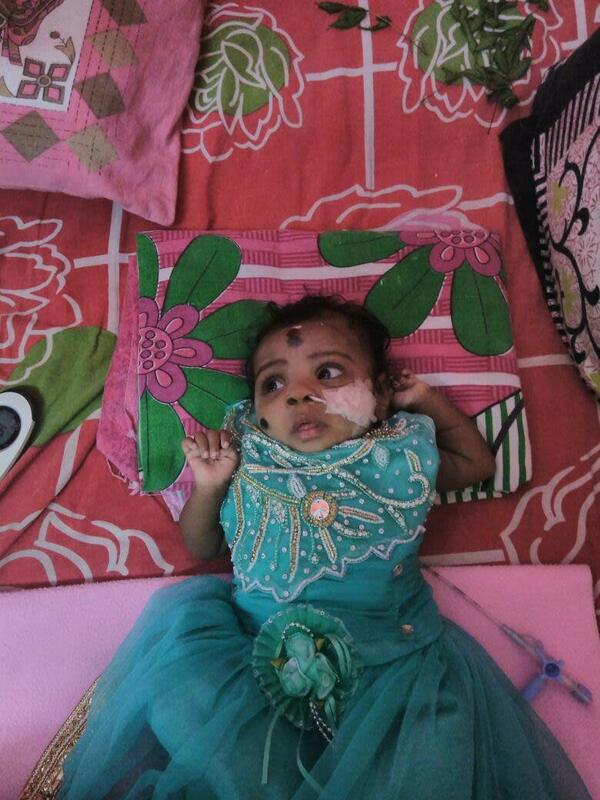 She was feeling better a few days ago, so the doctor said, "Rajkumar, you can take her home for a few days now." We tried feeding her orally. This phase lasts for 2 days at the max. She is active just for 2 days. The diarrhea is back. She is very weak. She cries most of the time, and we will be back at the hospital the next day. In the past few months, her medical bills have shot up to over Rs. 7 Lakhs. I work at a company that manufactures spare parts for automobiles. Although I earn Rs. 13000, I managed to save as much as I could, sell my wife's jewellery and take loans to pay this amount. 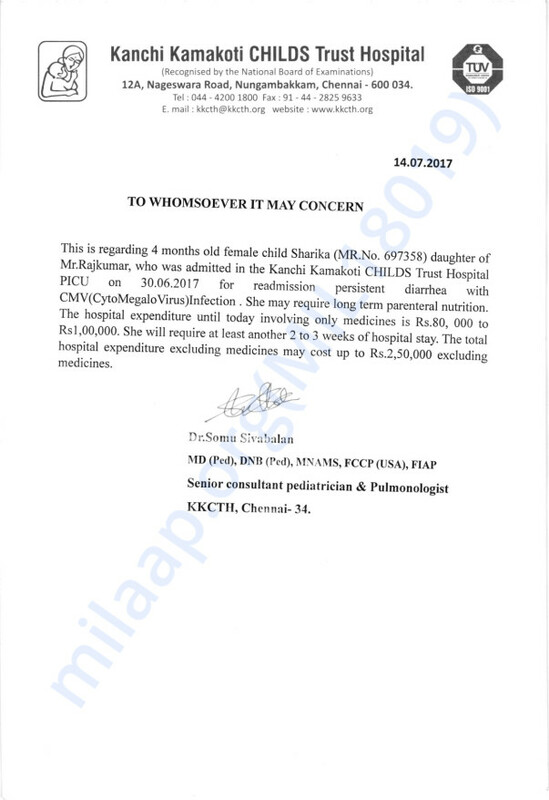 Now, my child needs further treatment and I'm at a point where affordability is just a dream. Honestly, I do not know how long it will take for her to recover. But I do know this. Nobody will give up on their new born child when she is fighting for life. My 5-month-old daughter has been feeling this way for a long time now. Your contribution will help me save her. She can finally come back home to us. 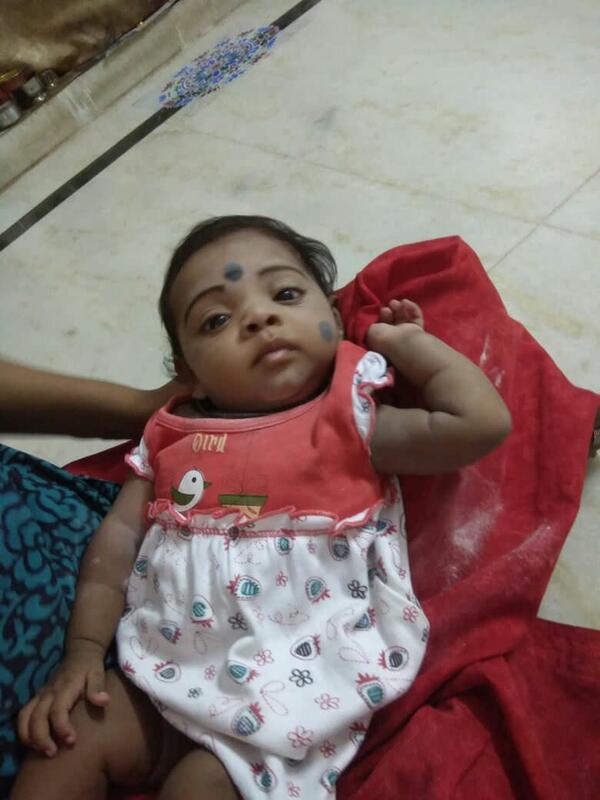 We are very happy to inform you that Sharika has completely recovered and is doing well now. She is back home with her family and currently does not require any regular check-up. She has gained a little weight and eats the food prescribed by the doctor. Thank you so much for the love and support shown towards her. We have some good news to share with you today. Sharika is doing better now and is recovering well. Her weight has also increased by 350-400 grams. As per the doctor's suggestion, the medication has to be administered for two more months.
" I just do not have words to thank the donors and all our well wishers, who supported us in our difficult. We are grateful for all their blessings and support that they have shown towards Sharika. 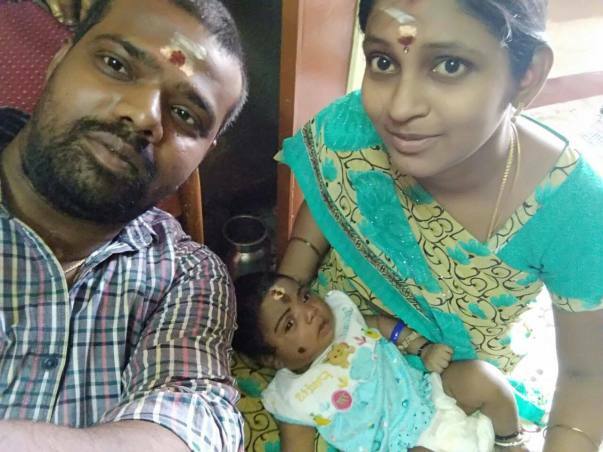 She is with us today only because of their blessings", Raj Kumar. Sharika is good now. She has been discharged from hospital and back to our home. Her loose stools are getting better now. Weight is still below the average and is not increasing. Intermediately She is undergoing Gene test based on doctor's instruction. 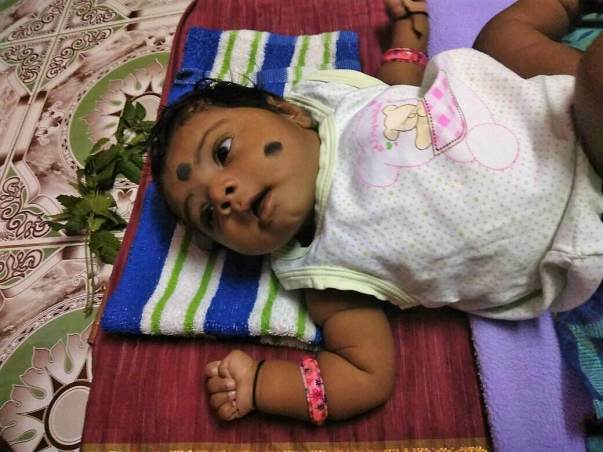 She is undergoing medication at home and can only have neocate infant food. We really want to thank Milaap and all the donors for helping us in our bad time. Raj was broken by the time he has requested for help from Milaap. The local money lenders had stopped giving money and since he was not able to go to office his monthly income too stopped. 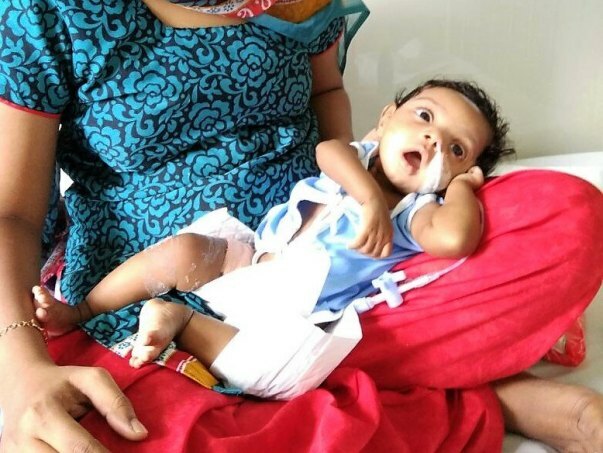 All of you came in the right time and helped this little girl.